It can be hard to know how to spend your time during a short visit to Tokyo. But you can cover a lot of ground with a little planning, checking off the must-see sights, heading out into the nearby mountains, and eating your way around the city. Here’s how to see Tokyo in just three days. By focusing on particular areas that interest you, you'll get to know Tokyo’s distinct culture and character in a short amount of time. Spend day one taking in the city's biggest attractions on a themed sightseeing tour by bus or on foot—you won't want to miss the Buddhist temples and Shinto shrines of the Asakusa district, the quirky youth culture in the Harajuku neighborhood, or the luxury shopping in Ginza and Shibuya. After a day of photo ops, settle in for the ever-entertaining Robot Restaurant cabaret show. Book tickets in advance to see a high-tech robot and laser performance with the option to also include dinner and drinks. After exploring some of Tokyo’s busiest areas, head out of the city to see some nature. Easily accessible by Japan's famous bullet trains (shinkansen), Mount Fuji is a must-see that holds a special place in the hearts and minds of the Japanese. While the peak can occasionally be seen from Tokyo, nothing a beats a convenient guided tour to the mountain to learn about its significance. Alternatively, head north of Tokyo to Nikko National Park on a guided day trip. The area's 17th-century shrines are some of the most beautiful in Japan, and there are plenty of hiking trails and onsen baths to suit your interests. Japanese food holds a lot of regional variation around the country. Learn about the cuisine’s variety—and how to cook some of its most iconic dishes—on a guided food tour. Start with an early morning Tsukiji fish market tour and continue on around the city to sample various bites. Choose a cooking class to learn the art of sushi-rolling or find out how to make the perfect ramen broth, or book a Japanese tea ceremony experience to gain insight into this high art. End your final day in Tokyo with a memorable dinner in a local izakaya pub or a revolving-sushi restaurant. If you’ve still got some energy afterward, head out on a Tokyo karaoke or bar crawl tour for some late-night fun. Enjoy a comprehensive Tokyo one-day tour, covering its best gardens, temples, shopping areas and a Tokyo Bay cruise over the course of your 8.5-hour trip. 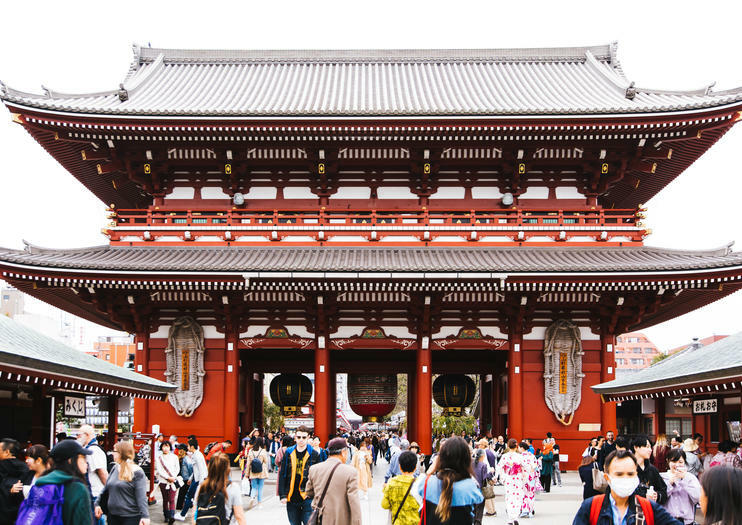 Check out Meiji Temple, the city’s most famous Shinto site before visiting the Imperial Palace and Tokyo’s oldest Buddhist site, Asakusa Kannon Temple (Senso-ji). You’ll also get to do some shopping in Tokyo’s Nakamise and Ginza districts before enjoying a 50-minute cruise on Tokyo Bay. This Tokyo excursion also includes a guide, coach transport, pickup from select hotels, entrance fees and lunch. Take a whirlwind sightseeing tour of Tokyo as you visit the city’s top landmarks, observe a tea ceremony and enjoy a river cruise during this 8.5-hour day tour. Follow your guide to attractions including the Imperial Palace, Nakamise shopping street, Asakusa Kannon Temple and Tokyo Tower observation deck. You’ll also enjoy a traditional Japanese tea ceremony and take a 40-minute cruise on the Sumida River. This excursion in Tokyo, perfect for those with limited time, also includes lunch, all entrance fees, pickup from select hotels and a souvenir city map. Discover Tokyo at your own pace on this 4- or 8-hour private, custom tour with guide. Design a tour that’s perfect for your interests. There’s a world of options, including the outer fish market at Tsukiji, the city’s temples and shrines, shopping excursions and food or sake tours. Your private custom tour includes a guide, entrance fees at select attractions, snacks, round-trip transport from your hotel with meet-and-greet and a car (for the private transfer option), or public transport (for the public transfer) and optional lunch (for the full-day tour). With the world’s highest number of bars per square meter, Tokyo’s Shinjuku Golden Gai neighbourhood is a must-visit for travellers with a vibrant spirit. This 2.5-hour walking tour of Shinjuku Golden Gai showcases the best bars, restaurants, and food stalls the compact enclave has to offer. Feast on four Japanese dishes, including Tonkotsu Ramen, and char grilled chicken, and delve into the area’s rich history with your guide. Small-group tour limited to 12 people. Roll your way to an afternoon of fun during this 2-hour sushi-making class taught by a professional chef. Don the traditional ‘happi’ coat worn by sushi chefs as you learn the skills and history of the sushi-making trade. Learn about the origins of sushi and watch a master at work preparing fresh fish. Then follow the instruction of your chef instructor as you prepare 2 rolls of sushi and 8 nigiri. Enjoy the fruit of your efforts for lunch, accompanied by a beef hotpot. A souvenir sushi-making certificate is also included. Hang out with Tokyo’s trendiest fashionistas and cosplayers as you shop your way through Tokyo’s world-famous Harajuku district and Omotesando Hills on this 2.5-hour walking tour. Harajuku and Omotesando are known worldwide for their trend-setting crowds of street-style aficionados, who come to show off the latest wears, and for their diverse selection of fashion boutiques spanning the high-end down to 100-Yen shops where you can shop for a few bargains. This must-do fashion-lovers tour also includes a guide and a train ticket from Shinjuku to Harajuku. Let a knowledgeable guide lead you on a Tokyo food-tasting tour at Sunamachi Ginza shopping street, especially popular with locals. Stroll past traditional fishmongers, grocers and other family-run shops selling ‘osozai’ (prepared food). During this 3.5-hour walking tour, you’ll sample enough delicious dishes and drinks for lunch and learn about Japanese culinary culture while you interact with vendors. Enjoy the perfect overview of Tokyo’s top attractions during this 8-hour city sightseeing trip with a small group. Travel through the Japanese capital by minivan, stopping for short guided walks at stops including Tsukiji Fish Market, the Meiji Shrine, Harajuku, the Imperial Palace East Garden, Asakusa and more.